Devrei Torah relating to the weekly Parsha. Rebbi mechabed ashirim, Rebbi honored the rich people, but Hakadosh Baruch Hu loves the poor. Which attitude is correct? They are two different subjects entirely. Rebbi didn't love the rich, he honored the rich. Hakadosh Baruch Hu doesn't honor the poor, he certainly doesn't, He loves the poor. And it's two different things. Rebbi honored the rich because the rich were doing something with their money; a rich man gives more maaser. If a rich man has ten thousand bushels of grain and he gives his tithe, he gives a thousand bushels. A thousand bushels of grain come in handy, so the Levi'im can sit and learn. A poor man will barely get a pot full of grain from his little garden, so what do we have out of him? Therefore you have to honor the rich because they are the vehicle of a mitzvah. 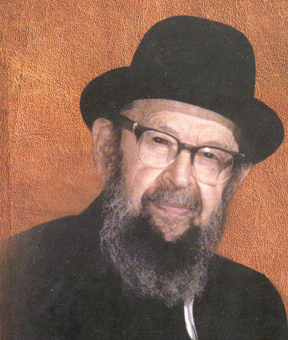 Why do you honor an Aron Kodesh? Because an Aron Kodesh contains a Sefer Torah. Why do you honor the Sefer Torah, after all it's only a roll of animal skin? Because the letters are written on them. And the rich were the chefetz of mitzvah, the rich were the object of mitzvah, they gave to the poor. The poor man however, could do the same if he had that much property, but you have to honor the ones who's hand is supporting so many needy people. That hand, like the Chofetz Chaim once said to a rich man who gave money, he said "I would kiss your hand if it wasn't a mechalel Shabbos hand,” he said. A hand that gives tzedaka deserves to be kissed. We shouldn't despise the rich, it's a big mistake yeshiva men make. A rich supporter of the yeshiva walks into the yeshiva with flashy clothing and the rosh hayeshiva is showing him around, so the boys are snickering behind their gemoro; they're making a big mistake. That man is kodesh kodoshim, that man is an object of mitzvah, you have to honor him, it's the will of Hakadosh Baruch Hu. Now it doesn't hurt him, because he has to give it away anyhow, otherwise he'll pay more income tax. Whereas the poor man who gives a dollar, the poor man doesn't have any taxable income, he gives a dollar it's a bigger thing. However this man is the one who is actually supporting the yeshiva and therefore he deserves to be honored. So Hakadosh Baruch Hu loves the poor because they were closer to Him, they didn't have so many bank accounts hanging between them and Him, so they can see Him, they can see Hakaosh Baruch Hu through the thin mechitza. But, you have to honor the rich, there's no question about that. This is transcribed from questions that were posed to Harav Miller by the audience at the Thursday night lectures. * Names will be displayed. Anonymous comments will be filtered at a higher level. ** Email addresses will not be displayed or used. Enter the characters from the image below.